(a) Temporarily tighten the rear disc brake bleeder plug. Fully tighten the rear disc brake bleeder plug after bleeding any air left in the system. (b) Install the rear disc brake bleeder plug cap. 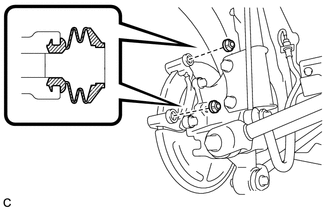 (a) Align the matchmarks of the rear disc and axle hub, and install the rear disc. 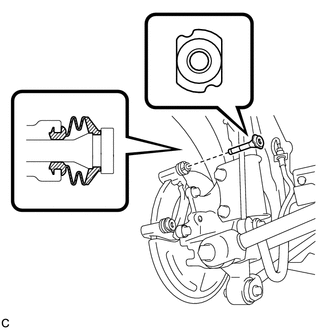 When installing a new rear disc, select the installation position where the rear disc has minimal runout. 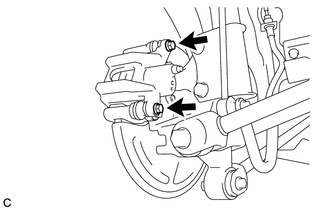 (a) Install the rear disc brake cylinder mounting with the 2 bolts. (a) Apply a light layer of lithium soap base glycol grease to the seal surfaces of 2 new rear disc brake bushing dust boots. Apply at least 0.3 g (0.01 oz.) 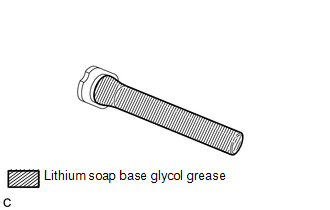 of lithium soap base glycol grease to each rear disc brake bushing dust boot. (b) Install the 2 rear disc brake bushing dust boots to the rear disc brake cylinder mounting. 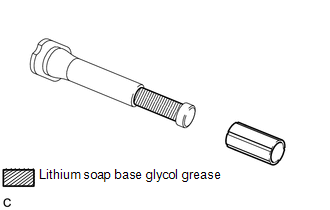 (a) Apply a light layer of lithium soap base glycol grease to the sliding part and the seal surface of the No. 2 rear disc brake cylinder slide pin. (b) Install the No. 2 rear disc brake cylinder slide pin to the rear disc brake cylinder mounting. (c) Push the No. 2 rear disc brake cylinder slide pin into the rear disc brake bushing dust boot to align them. 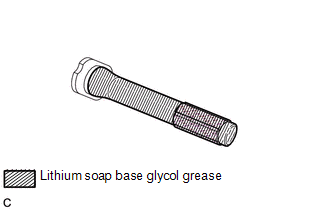 (a) Apply a light layer of lithium soap base glycol grease to the contact surface of the No. 1 rear disc brake cylinder slide pin. (b) Install a new rear disc brake cylinder slide bushing to the No. 1 rear disc brake cylinder slide pin. 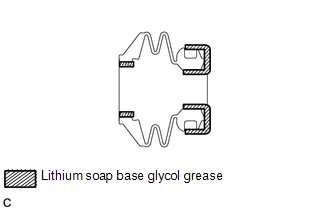 (a) Apply a light layer of lithium soap base glycol grease to the sliding part and the seal surface of the No. 1 rear disc brake cylinder slide pin. (b) Install the No. 1 rear disc brake cylinder slide pin to the rear disc brake cylinder mounting. (c) Push the No. 1 rear disc brake cylinder slide pin into the rear disc brake bushing dust boot to align them. 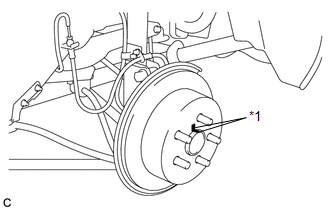 (a) Install the 2 rear disc brake pad support plates to the rear disc brake cylinder mounting. Be sure to install the plates in the correct position and direction. (a) Install the rear anti-squeal shims to the 2 rear brake pads. When replacing worn pads, the rear anti-squeal shims must be replaced together with the pads. Install the shims in the correct positions and directions. 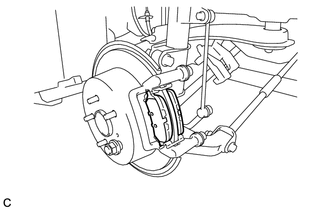 (a) Install the 2 rear disc brake pads to the rear disc brake cylinder mounting. 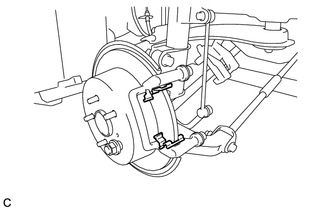 Make sure to install the rear disc brake pads with the pad wear indicator to the inner side of the vehicle. There should be no oil or grease on the friction surfaces of the rear disc brake pads or the rear disc. 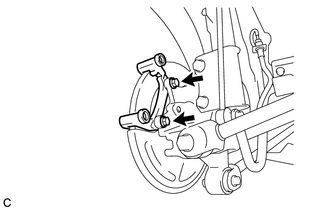 (a) Install the rear disc brake cylinder assembly to the rear disc brake cylinder mounting with the 2 bolts. 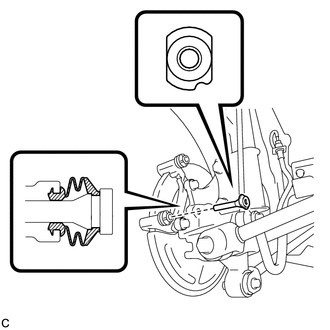 (a) Connect the rear flexible hose to the rear disc brake cylinder assembly with a new union bolt and a new gasket. 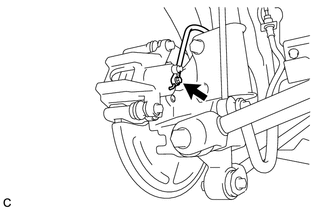 Install the rear flexible hose lock securely into the lock hole in the rear disc brake cylinder assembly.